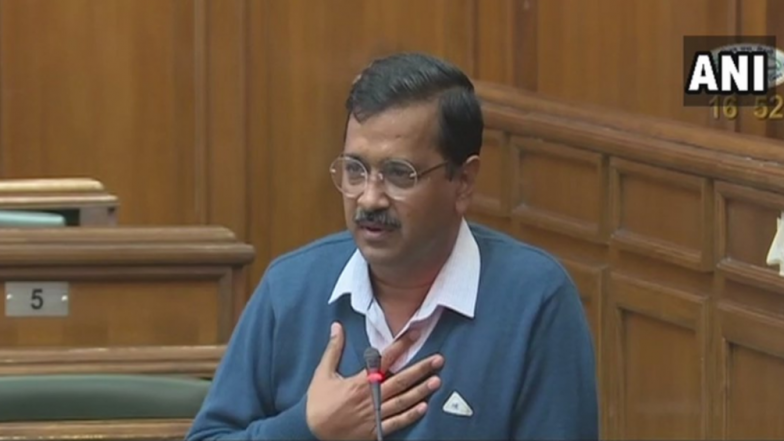 Panaji, April 13: AAP national convener and Delhi Chief Minister Arvind Kejriwal on Saturday said BJP chief Amit Shah would be Union home minister if the NDA under Prime Minister Narendra Modi is re-elected. He also slammed Shah for a recent comment at a poll rally in West Bengal that the BJP, if re-elected, would remove infiltrators from the country, except those who are Hindu, Buddhist or Sikh. Arvind Kejriwal Allies With JJP in Haryana After Congress Snub in 2019 Lok Sabha Election; Why AAP Decision May Be A Gamble Played Right. "A dangerous game is going on. You have to keep it in mind when you go to vote. Everyone says if Narendra Modi becomes prime minister, then Amit Shah will be next home minister of India," Kejriwal said addressing AAP workers at Margao town in South Goa. "You can imagine what will happen to a country whose home minister would be Amit Shah," Kejriwal claimed. Shah is contesting from Gandhinagar Lok Sabha seat in Gujarat, were polling for all 26 seats will be held in a single phase on April 23. "He (Shah) has said that if they (BJP-led NDA) come back to power, they will remove every single infiltrator from the country except (those who are) Hindu, Buddhist or Sikh. Amit Shah feels every Christian, Muslim, Parsi, Jain who lives in the country is an infiltrator. This is a dangerous statement," Kejriwal said. The Delhi Chief Minister said Shah's statement is more relevant and disturbing for states like Goa where over 40 per cent of the population belong to the minority communities. Lok Sabha Elections 2019 Schedule: How Staggered Polling Could Help BJP. "Goa has 15 lakh people and around 40 per cent of them are minorities. How will he (Shah) implement it (removal of infiltrators) in Goa? What will these six lakh people do? Will he throw them in the sea or lynch them? Will he create riots?" he questioned. AAP is fighting both the Lok Sabha seats in Goa. Its state convener Elvis Gomes is contesting from the South Goa seat and general secretary Pradeep Padgaonkar from the North Goa seat.